I recently added the new T-Fal Extreme Titanium frypan to my kitchen. It sounded like the perfect cookware for myself as I often make a mess when I cook, including getting food stuck and burned onto pans. T-Fal’s Extreme Titanium line of cookware is the newest in their non stick technology, made with a non-stick scratch resistant coating that can even be used with metal utensils. T-fal offered me a culinary challenge, and I wanted to put the pan to the test by cooking something fun and also challenging. I ended up making some delicious Japanese Souffle Pancakes, also known as Fluffy or Jiggly Pancakes. Japanese Souffle Pancakes seemed like the perfect type of “sticky” food to cook on my Extreme Titanium pan. These pancakes originated in Japan and are cuter than traditional pancakes because of its fluffy texture. They jiggle when you shake them and also have a creamier taste. 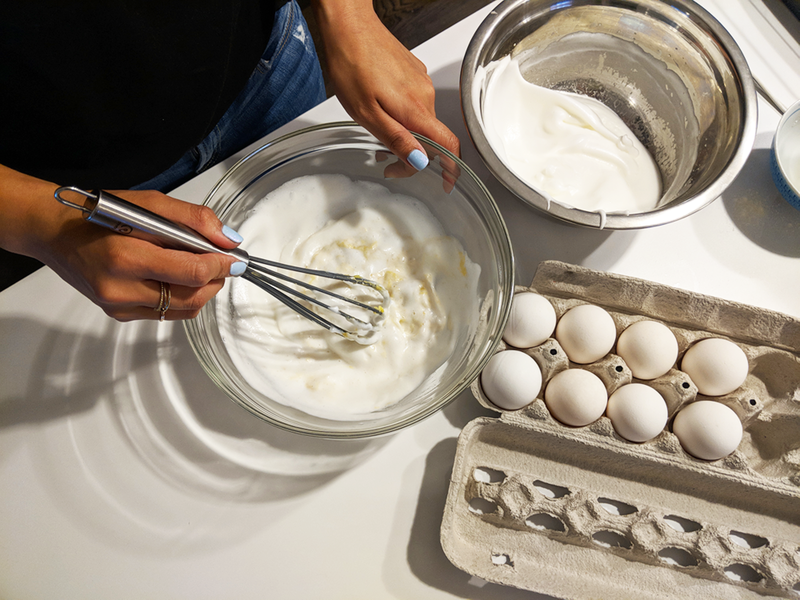 The batter I used was made from scratch and was a sticky mess of flour, egg yolks, whipped egg whites, cornstarch, sugar, greek yogurt and more. Pre-heating the pan was easy with the Extreme Titanium pan’s Thermospot indicator that turned into a solid red circle when the pan reached the ideal temperature to start cooking. We made parchment paper ring molds for the fluffy pancakes to give it that consistently cute shape! Using a medium-low setting, we fried the pancakes to perfection and even with the sticky batter, the pancakes flipped with ease on the Extreme Titanium pan. The pancakes turned out great and yes, they jiggled. It was my first time making Fluffy Japanese Pancakes and it was pretty easy to make with T-Fal’s new frying pan. I was lucky that my mom has been really into making these recently and was able to teach me the recipe. With her help and using the T-Fal Extreme Titanium pan, I was able to make some delicious pancakes and clean up with ease.